When you want to pack healthy meals for your kids amidst the morning chaos, the freezer is your best friend. Keep it full of ready-to-cook or eat goodies and you’re guaranteed a smooth-sailing school day. Read on our list of freezer-friendly lunch box ideas and learn a thing or two on how to freeze them properly for a longer shelf life. Whether you have a small or large household, freezing make-ahead lunch and snacks is a great time saver. It’s a good way to extend the freshness of your food, avoid wastes, and save on prep time. More importantly, it lets you and your kids enjoy satisfying, homemade meals despite a busy day. But before you start freezing those yummy goodies, it’s best to know the tips and things you’ll be needing to freeze food the right way. Baking pans, sheets, and trays. Most food will have to be frozen initially for a few minutes or hours in a pan or tray before packing them in freezer bags. This will keep their shape as well as prevent them from sticking to another food item. Freezer-safe bags and containers, aluminium foil, parchment paper, and plastic wrap. When frozen food is not wrapped up properly, it can develop dry and discoloured spots called freezer burn. While food with freezer burn is still safe to eat, it can affect its flavour. So make sure to know how each food type should be wrapped. It is also ideal to portion your frozen food using a container with the right size. This will help avoid thawing everything out then putting the leftovers back in the freezer. Also, a vacuum sealer may also come in handy for easier and safer food packaging. Tape and permanent markers. It’s highly advisable to label your freezer bag or container with its contents, serving size, and shelf life before it goes in the freezer. If your are freezing ready-to-cook items, it is also a good idea to write brief instructions on how to cook them. Practice first in, first out (FIFO). Frozen food does not stay fresh forever. So if you are preparing multiple food items for freezing, make sure you arrange or stack them properly, too. Place the items with shorter shelf lives at the front so you can consume them first, while newer ones stay at the back for later use. Vacuum sealing lunch box treats helps remove the air out to prevent freezer burn. With your freezing equipment and supplies ready, it’s time for the fun (and yummy!) part: making your stash of freezer-friendly goodies. Here are some fabulous ideas you can try. Muffins, fruit or vegetable loaves, cookies, scones, and pancakes are some of the most popular quick breads. 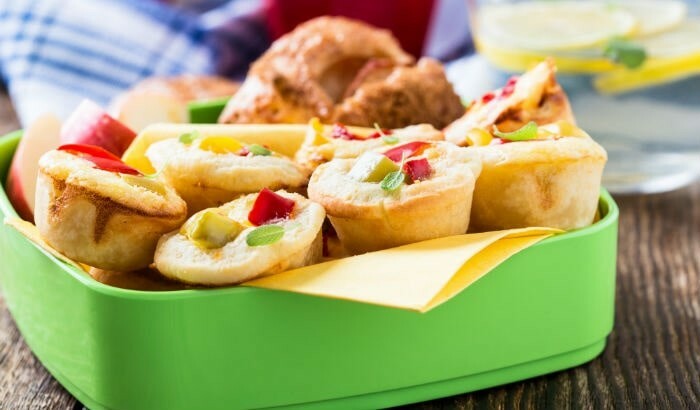 What makes them lunch box favourites is that they are easy to prepare and versatile—sweet or savoury add-ons can easily put a twist to your basic batter or dough. Moreover, as the name suggests, quick breads are ready in no time as they do not need to be fermented or proofed. They taste delightful even when thawed out from the freezer and reheated, too. Try to bond with the kids over the weekend while whipping up a batch of make-ahead blueberry muffins or bacon and cheese scones. Make sure to cool your baked goodies completely before popping them in the freezer. How to freeze: Place the loaves on a baking tray, cover the top loosely with plastic wrap, then freeze them for an hour or until solid. Wrap each loaf tightly in plastic wrap then place them in double resealable freezer bags. Make sure to remove all the air from the bag before sealing to prevent freezer burn. Portion and label each bag. Alternatively, rather than storing them whole, divide your loaves into slices, then wrap and freeze following the same steps. Reheating tips: Thaw out your whole or sliced loaf at room temperature for about 30 minutes. Warm them up in the microwave for a few seconds to a minute or at a 175C oven for 10 to 15 minutes, depending on the size. How to freeze: An important thing to note about freezing cookies is that not all cookie types are ideal for freezing. Cookies that work well in the freezer include those made with a lot of butter such as shortbread, gingerbread, drop cookies, icebox cookies, and sugar cookies. However, cookies that have more liquid in the recipe like tuiles, florentines, and pizzelles or have a cake-like texture like madeleines are not as freezer-friendly. For baked cookies and scones, stack them in freezer-safe containers, lined with parchment paper in between then freeze. For unbaked cookies or scones, portion your dough, place them in parchment-lined baking trays, then freeze until solid. Transfer the frozen dough into labelled freezer bags then freeze. Reheating tips: For baked cookies and scones, thaw them out at room temperature for about 30 minutes so as not to make them soggy. Warm them up in the microwave for a few seconds to a minute or at a 135C oven for 10 to 15 minutes, depending on the size. For unbaked ones, place them on a baking tray with parchment paper then bake them as usual. Take note however that baking frozen cookie or scone dough may take about a minute or two longer. Whip up a batch of baked muffins for freezer storage so you can easily reheat one or two for school. How to freeze: Place the muffins on a baking tray, cover the top loosely with plastic wrap, then freeze them for an hour or until solid. Wrap each muffin tightly in plastic wrap then place them in double resealable freezer bags. Make sure to remove all the air from the bag before sealing to prevent freezer burn. Portion and label each bag. Reheating tips: Thaw out your frozen muffins at room temperature for about 30 minutes. Warm them up in the microwave for a few seconds to a minute or at a 175C oven for 10 to 15 minutes, depending on the size. How to freeze: Place your cooled pancakes in parchment-lined baking trays, then freeze for about 30 minutes or until solid. Stack your frozen pancakes with parchment paper in between then transfer them into labelled freezer bags. Reheating tips: Warm your frozen pancakes in the microwave for a few seconds to a minute. If you’re reheating them in the oven, place them in a parchment-lined baking sheet, cover it with aluminium foil to protect them from drying out, then bake at 175C for about 10 minutes or until warm and soft. No need to wake up early in the morning as yeast breads and pastries are also perfect for freezing. Have a stash of frozen baked bread in the freezer so you can have them thawed out overnight, ready for the microwave or oven in the morning. Pack it with fruit and juice and it’s good to go! How to freeze: This breakfast or snack favourite can be frozen by means of par-baking. Instead of baking your rolls fully, bake it for 10 or 15 minutes only or until the buns look set but still pale in colour. Let the buns cool in the baking pan, then wrap it with plastic for freezing. You can leave them as is or unmould it when solid then wrap again before putting them back in the freezer. Reheating/baking tips: Thaw them in the refrigerator the night before you want to serve them, then bake them the next morning for another 15 minutes or until completely baked and golden. While baking, make sure to whip up a quick frosting! How to freeze: After baking a batch of scrolls made with your favourite fillings, cool them at room temperature. Place them on a baking tray, cover the top loosely with plastic wrap, then freeze them for an hour or until solid. Stack and store them in freezer-safe bags in between sheets of baking paper. Reheating tips: Thaw out the frozen scrolls in the refrigerator overnight then reheat them in the microwave or oven for a few minutes until warm and soft. Prevent baked pastries from sticking when frozen by inserting sheets of parchment paper in between. How to freeze: Flash freeze your cooled mini quiches for an hour or until solid. Transfer your frozen quiche to a labelled resealable freezer bag. Reheating tips: Reheat your still frozen quiches in the microwave for a few seconds or in a 190C oven for about 10 minutes. Make sure not to overheat your quiches as they can become tough. Warm soups make the ideal balanced lunch and are perfect for beating colder days. Sauces, on the other hand, are versatile and can be used to make a number of lunch box meals, from pasta dishes to mini pizzas to quick casseroles. Make soups and sauces in bulk to save time, cool them completely in the fridge, then portion them in freezer-safe containers or bags. Just throw in a few simple ingredients into your frozen mixture when reheated to make one exciting lunch meal after another. How to freeze: Prepare the basic soup base first, saving the addition of noodles or fresh vegetables for later. Place the cooled soup in the fridge to cool it down further. Once cold, portion your soup stock in freezer-safe containers or bags then freeze. Alternatively, you can also pour your stock in ice cube trays. When frozen solid, divide the soup cubes into individual portions for storage. Reheating tips: Reheat your frozen soup stock in a saucepan. Once it starts to boil, you can add in dried pasta noodles, vegetables, dairy, and other seasonings. Transfer them in insulated food jars to keep the soup warm. Make sure to pack a few slices of bread for dipping! How to freeze: Portion your cooled sauce in freezer-safe containers then freeze. If you are using freezer bags, let the filled bags freeze for an hour on a flat surface. Once solid, you can arrange them upright, as you would books on a shelf, to save space. Reheating tips: Thaw out your frozen sauce in the fridge for at least 4 hours. You can also thaw it out by immersing the freezer bag or container in a bowl of cold water. Transfer your partially thawed sauce in a saucepan then let it simmer for a few minutes. Pack it with cooked pasta, as dip for chips, or as sauce for a fun build-your-own pizza meal. Ideas for making school lunches are indeed endless. And with a trusty freezer ready to help you prepare, packing delicious home-cooked meals and snacks is always stress-free even on your busiest days! Aimee is a content writer for Kitchen Warehouse and a foodie at heart. Also a trained pastry chef, she bakes in her spare time to make people happy.